Do You Need A Cell Phone Holder For Your Office Or Home Desk? WizGear's cell phone stand is the best choice for this purpose, thanks to its smart and sturdy minimalist design. You can use this phone holder for any kind of mini tablet and smartphone, so it is perfect for both iPhones and Android devices. The cell phone holder has the smartest design that will keep your expensive device securely and sturdily in place. Do You Like To Have An Organized Desk? Then you probably get very annoyed by the cable of your smartphone charger. Thankfully, we have created a great solution for you! On the bottom of our smartphone stand for desk there is a cable holder system with two nonslip and secure slots. These slots will hold the charging or USB cable out of the way and always have it ready for use, so your desk will remain neat and organized! A Great Angle To Use And See Your Phone Screen Clearly! Take a look at the pictures. The WizGear cell phone stand has an inclined design that keeps your phone in a semi vertical angle. That is the perfect position, since it allows you to use your phone effortlessly and have optimal visibility of the cellphone screen. 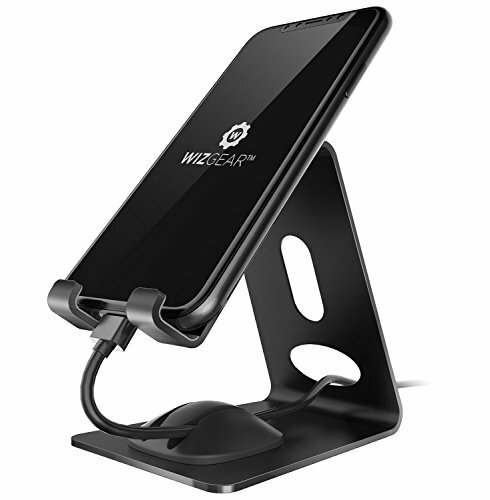 For this reason, WizGear have backed up the cell phone stand for desk with a one year manufacturer's warranty. This means that if your new cell phone desk holder is defective, you can return it to us and get a new one without having to pay! WizGear has made this a completely safe and hassle-free experience for you, so don't hold back any longer! KEEP THE PHONE CORDS OUT OF THE WAY: At the bottom of the iPhone holder for desk there is a cable holder system. When you're charging your cell phone, you can insert the cord of the charger intothe slot so that itwill always ready for use, and won't get tangled and create a mess on your desk. SUITABLE FOR ALL SMARTPHONE DEVICES: The cell phone stand for desk can hold all smartphone devices, as well as all mini tablets. So whether you have an iPhone or anAndroid smartphone, an iPad or any other tablet brand, this iPhone desk stand will never fail to hold it sturdily and securely! ABSOLUTELY STURDY DESIGN AND MATERIALS: Once your place your smartphone or mini tablet on the stand for iPhone, it will stay in place and not slide or fall. The metal frame is smartly designed and incredibly strong, so it can withstand the weight of your device without any problems. US PATENT PENDING: BUY THE CELLPHONE STAND WITH CONFIDENCE: Is there something wrong with the cell phone desk holder? WizGear offers you a one year warranty, so if your new smartphone holder is defective, we can replace it completely free of charge! This is a 100% hassle free purchase, so place an order today! If you have any questions about this product by WizGear, contact us by completing and submitting the form below. If you are looking for a specif part number, please include it with your message.